Bring broth to a rolling boil, add quinoa, cumin, sage, bouillon, and garlic. Drizzle two tablespoons of olive oil and stir to combine. Season with sea salt and black pepper and reduce heat to low. Put the lid on and simmer until all the liquid is absorbed and quinoa is cooked but still firm to bite (al dente) about 15 - 20 minutes. Turn heat off and leave lid on. In a deep sided skillet on medium heat, add three tablespoons of olive oil. When hot, add onions, apples, celery, sausage and garlic. Sauté until soft. Add shrimp, sautéing a further 4 minutes or until shrimp turns pink. Add Quinoa and stir well to combine. Add parsley and season with sea salt and black pepper to taste. Drizzle extra olive oil on top and serve hot. Hi Mia - Sounds delicious! How many does this recipe serve? I love the use of the quinoa here. Must give it a go. Seasoned Kitchen - this should serve between 6 to 8 people. Thank you very much! How wonderful! A delicious way to make jambalaya! Thank you Lizzy! It was very good! 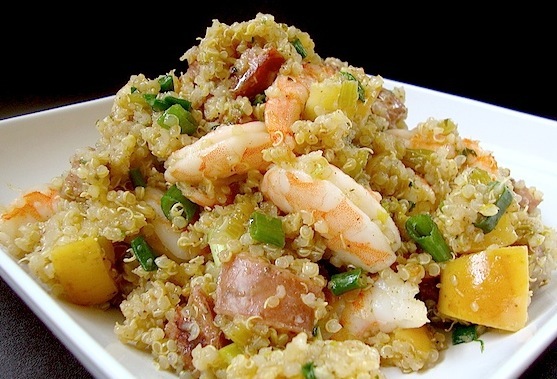 I love quinoa and this looks absolutely fantastic! This looks delicious, Mia! It sounds so light and healthy!